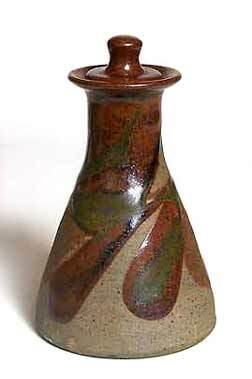 Aller Pottery bottle - 5⅛" (130 mm) high. Bryan and Julie Newman set up their pottery in Dulwich, South London in 1961. They made earthenware and stoneware pots and Bryan specialized in sculptural pieces. In 1966 they moved to the village of Aller, a couple of miles north of Langport in Somerset, and established Aller Pottery. Since moving to Aller they have made stoneware exclusively and use two oil fired kilns, one of 65 cu ft capacity and the other of 18 cu ft. Most of their output is decorative domestic ware, but Bryan still makes the occasional sculptural work.